The CNOR exam is quite simply a measure of your knowledge of the scope of practice of providing care to patients before, during, and after surgery. Hospitals use the CNOR certification as a standardized measuring stick to compare perioperative nurses. While it may not be fair, a nurse’s entire professional career could be completely overshadowed by their CNOR exam result. 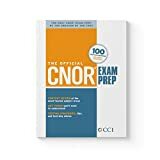 The whole purpose of the CNOR Books / Study Guides : to give nursing professionals the keys to understand how to succeed on the CNOR exam.